I was fresh off the plane for my sophomore year abroad in Scotland. Feeling a bit angsty/ homesick, I went to the record store to score Jagged Little Pill. Flipping through the Ms on my way to that disc, my fingers stopped cold at a familiar yet new cover. I picked up the CD, realizing my fingers were trembling with emotions I’d suppressed for seven years. 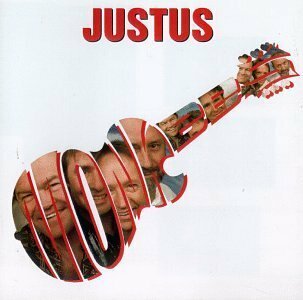 I counted the heads on the cover twice. When I got home, I shoved Justus in the boom box with barely a glance at poor angst-ridden Alanis. And when the first chords of the new Circle Sky shot out of my speakers and slammed into my eardrums, I nearly wept with glee as the upside of my tween obsession flooded back to me. 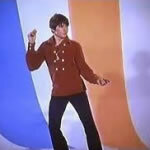 My second wave of Monkee fandom had begun. After fighting our way though the (abominably organized) merchandise line, Cin, her husband Steve, Lauren (AKA “Mich”) and I settled into our shockingly close seats. Off to the far reaches of stage left we couldn’t really see half the screen or the side where Coco and Christian would be playing, but we had almost perfect line of sight for the guys, and were probably less than 30 feet away from where Peter would appear in a half hour. We giggled and laughed through the commercials (many of which we’d seen, though there were some new things to us). Then, just before the house lights lowered, the three of us spied a very familiar fedora-ed silhouette in the wings off to stage right. The overture was tight and rocking, and played against a backdrop of more video. The house went totally dark, and then…they were there. I screamed like a banshee. Clarksville was tight and wonderful, and worked as well as it always has as an opener. Hearing it for the first time live in far too long, I was reminded once again how incredible Micky’s voice really is. Then came the intros, and the house went nuts, insane, and totally bloody Bananas as Peter, Micky, and Nez introduced each other. Then we headed straight into Papa Gene’s Blues. It was played in sort of a hybrid between old school Monkees and the way Nez does it solo. Rocking, but somehow picking up some new nuances as the song has “matured”. Reality hit me about 30 seconds in, and I could almost hear the item “See Michael Nesmith Play Live” checked off my bucket list. Next was Auntie Grizelda, a song I was little sad to see on the set list. However, For the FIRST time ever in my experiences as a concertgoer, Peter actually seemed to be totally, unironically ENJOYING that damn song, and milked it for everything it was worth with both voice and unforgettable dance moves. She, which came up next, was played well and played for laughs, complete with Nez coming in late with the “hey!”s and Peter’s antics nearly making Micky dissolve in hysterics at several points. Then came the highlight of the first set for me–Sweet Young Thing. Somebody hollered out “I love you, Papa Nez!” as he launched into the lyrics which will always be tied to the happier paradigm shifts of 2012. This new roots tribal Nezzish version, which must be heard and seen to be believed, is my new definitive take on the song. Everyone was hitting their stride–from Micky on the cajon box, Peter’s tasty acid-bluegrass banjo solo, and of course Nez’s voice, which just keeps getting better as the tour rolls on. After Micky caught his breath, we got some songwriter name dropping and Shrek Schtick before the set-ending crowd pleasers I’m a Believer and Stepping Stone. Both were done in the usual vein, though the former seemed to have picked up a few subtle hints of Micky’s Remember version. Then came Darkness, and silence, and I Wanna be Free on video. We sang along, arms over each others’ shoulders, Mich’s right arm over the strangely empty seat to her right. The morning after buying Justus, made a beeline for the computer lab. I found alt.music.monkees, the original Monkees listserv, and Videoranch, where I promptly read the first 6 chapters of the in-progress Long Sandy Hair of Neftoon Zamora. By the time I’d read through to Nez’s, er, bumpy arrival in Welach, I was a Nezhead for life. The solo tapes and CDs I bought locally and scored from my new Monkee friends merely sealed the deal. Interestingly, my friendships online made me more confident in my RL social acceptability, and I soon had a passel of fellow philosophy geeks to hang out with. I even had a ticket to see all four Monkees in Glasgow! But I didn’t go. Instead, I went home for spring break to see my boyfriend. Confident in Nez’s promise of US tour dates and acting in the spirit of my long-ago resolution to “Take a Giant Step” into reality, I flew home, only to discover both my boyfriend and I had changed too much for the relationship to survive. 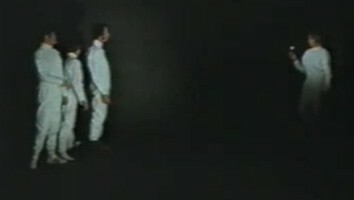 And then I logged into the Monkees mailing list, and learned that Nez had quit. It’s darkly amusing now that for 15 years, I considered that decision the second biggest regret of my life. Speaking of Peter, he launched into his “eponymous” tune, with Nez backing ably on the mighty Hammond B3. (Sorry Mick, but these days I much prefer Peter’s vocals on this tune, particularly on the hysterically psychedelic Cambria Hotel version.) And then we got a delightful dissolve into Early Morning Blues and Greens, also sung by Peter. Not only did Peter take this song to emotional levels that Davy didn’t (and probably couldn’t at that age), I would LOVE to hear Shoe Suede Blues remake this one in some form a la For Pete’s Sake and Clarksville. As Peter wound down the tune, a Tympani emerged from the wings, to squeals of glee. In this crowd of uberfans, EVERYONE knew exactly what that meant. Peter vested Micky in the ceremonial tablecloth, and Micky rocked out Randy Scouse Git as he has so many times before (and hopefully will many times again, fandom gods willing.**). Next, we got Daily Nightly. We got the Full Moog Treatment, plus scrabble. As always, there are no words for this solemn and tasteful performance, so here’s a video. Actually, there were going to be two, but Mich’s won’t embed for some reason. Grr. This closer angle captures some banter related to the Blonde Gretsch’s meltdown that wasn’t as clear in her video or my audio, not to mention the intricate, delicate nuances of a sensitive rendition of what might be the most metaphorically profound compositions of Nez’s 60s oeuvre. After the playful and all-too rare ribbing of Nez from Peter captured above, it was time for Tapioca Tundra, the first minute or so of which is also included above. This was always a good-not-great song for me, that only occasionally popped up in the back of my head. However, when reinterpreted by our favorite Mature Loon, this song is taken to a completely different level as it was in the 60s. Perhaps it truly can’t be part of him anymore because it’s part of us *** , but everyone in the audience tried to return what Nez has given us as best we could. And now that Mich and I had gotten our Nezhead moments, Cin got some Dolenzkateer satisfaction with Goin’ Down. Complete with the now-obligatory Breaking Bad namedrop, the performance was tight and the front row victim acquitted herself well on the lyrics. And then the house lights went down again as sirens wailed, foghorns blew and the most famous sound test in the fandom rang from the speakers. I wouldn’t say I was ever mad at Nez, really, except maybe for those horrid 15 seconds on August 8 when Abba’s Dancing Queen came up on my iPhone at the perfectly wrong moment. But looking back on that moment now, I realize I was really mad at an unjust universe, not someone coping with a situation that was likely more complex than I’ll ever know. In any case I spread the blame for ’97 evenly. Having read I’m a Believer some years before, I was under few delusions regarding the Monkees’ personal and interpersonal quirks. 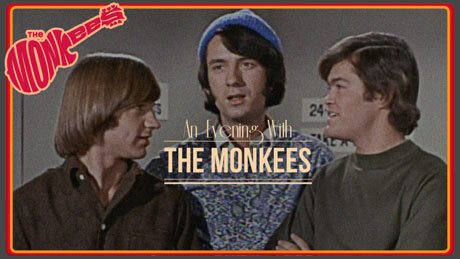 As it happens, my regret at missing what was indeed my first and last chance to see all four Monkees on stage simultaneously was tempered a few years later. When I visited the rest of the Femmes in 2001, Cin broke out a bootleg VHS from the 1997 UK tour. Davy, Micky, and Peter seemed to be bopping around in their usual way at center stage. WAAAY off to the left, almost offstage, was Nez. Forget all the grinning and goofing we’ve seen the last two weeks, the man seriously looked like was fighting the urge to bolt offstage at the first opportunity. In a way, I guess he did. I don’t know or pretend to know what happened between any or all of them on that UK tour, not that it’s any of my business. I also might have been projecting. But I do know that if I’d seen that sight live, the ’97 implosion might well have put me off the fandom for good. And if I’d left the fandom in 1997, I wouldn’t have my sisters. I hesitate to say “it worked out for the best” (that often seems a lazy answer from people who are afraid of facing life’s darker sides), and hindsight doesn’t make that choice any less miserable. Maybe, to paraphrase Morpheus, what happened, happened, and couldn’t have happened any other way. I certainly wouldn’t have been chanting along to the video of Ditty Diego with my sisters in the darkness of the Lakewood Civic Auditorium. 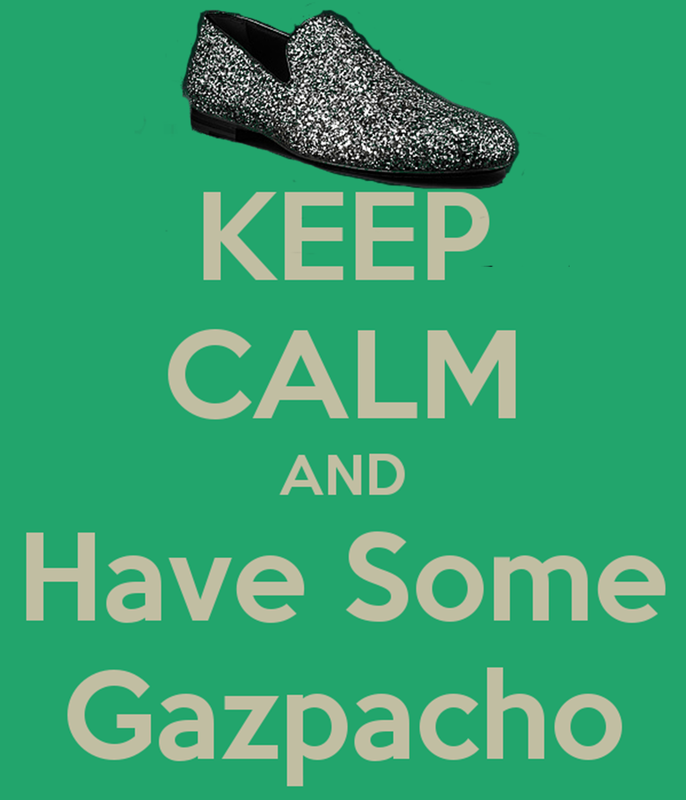 But then again, why should anyone listen to me, since I know nothing? I’ll admit it– I nearly lost it on Porpoise Song. Normally this song evokes the journey of personal and intellectual discovery I lived that year in Dundee. But this is 2012, not 1997. I stayed right there in that moment, burning a new level of meaning into my internal music video for that song. While as a Nezhead I kind of wish we’d gotten Nez singing Daddy’s Song, I get why they didn’t go there. It’s sort of the same reason they didn’t break out Shades of Grey on this Headquarters-centric tour and used Davy’s album (NOT MOVIE) vocals on Daddy’s Song. But Peter sang his Can You Dig it? BETTER than the alternate version from ’68 by several orders of magnitude. I was pudding by the absolutely stunning instrumental break. Then came my favorite track from Head. As We Go Along was our first dance at Kevin’s and my wedding in 2001. Our relationship is sort of a weird cross between Shrek & Fiona and Sheldon & Amy, and we have absolutely made up our story as we’ve gone along. As poignant as the moment was, we were happy to assist when Peter cheekily encouraged us all to clap out the time signature to help Micky out. Speaking quasi-objectively, Circle Sky was the highlight of the Head playthrough. Nez and company knocked this one out of the park and waved giddily as it sailed off into the stratosphere. I felt like I might actually have gotten a taste of what it was like in that auditorium in Salt Lake City in ’68. Not to be outdone, Peter proceeded to blast out Long Title with a verve that made all three of us squeal. This one’s got another Wedding/Anissa connection–she deejayed Cin’s wedding to Steve, and in a very Anissa-esque moment of puckishness, dedicated this number to Steve in a hat-tip to his previously rocky marital history. 🙂 And then the house lights went down again and the final video interlude started. Anissa’s on the left. 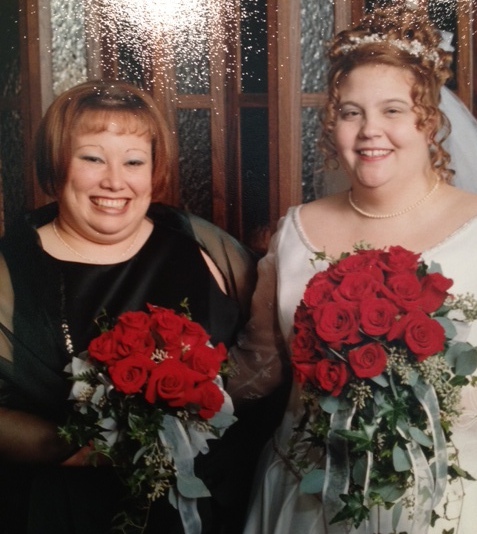 2001 wedding fashions FTW. There are always and forever four Frodis Femmes, just as there are always and forever four Monkees. In some ways key traits of each of our personalities map to theirs, due to coincidences of personality and upbringings. While I’m certainly an insecure, temperamental, and snarky redneck geek who has a fraught relationship with her inner child, I’m rather more optimistic than Nez (and definitely less creative). Mich in her way has both Micky’s zaniness and a sardonic Peter/Nez edge to her humor. As for Cin and Anissa…there’s one moment I’ll never forget from that awful week in May that highlights all this, a moment that sprang to mind as we uneasily shifted in our seats through the final Davy tribute video, anticidreading what we knew came next. It was the day before the funeral. After an hour or so Cin and I had exhausted the topics of her pets, my pets, breaking news, our various job travails and the weather. Then Cin, who somehow combines Micky’s interpersonal insights and diplomatic skills with Peter’s compassion, said the words that we both knew, that had been sitting in the pit of my stomach for the five days since we lost our short, puckish, quick-witted Drama Teacher sister. And I, the guilt-ridden Nez of our foursome, dissolved into tears on her shoulder as we both cried. In that moment my young adulthood ended, and I think Fandom Lenses might have been born. Life and fandom are not two oppositional forces battling to throw the other into the Black Box of my subconscious, but two metaphorical and theoretical lenses, always changing inside (as my favorite Monkee Peter would say), and always already informing each other (as my favorite philosopher Hans-Georg Gadamer would say). But then the lights came up and ended my reverie. Micky stepped to the microphone, visibly emotional. My analytic self gracefully handed the reins off to my trembling inner Frodis Femme. Only Camille was strong enough to get me through the next few songs. Somehow I had BARELY stayed dry-eyed through the tribute. However, when Micky nearly lost it when he told us they couldn’t sing Daydream Believer anymore, I went sailing over the edge. The lady they plucked from the audience to lead the singalong nailed the song, and her spot-on Davydancing obliterated any lingering tension. We were all suddenly kids, singing into our hairbrushes as we danced in front of the closet mirror in 1967, or 1987, or 1997, or 2012. It was a tribute that will warm the cockles of any Davybaby’s heart and is second only to Bay City for my Most Poignant Concert Moment Ever. After Peter’s request schtick, we got What am I doing Hangin’ Round? as the “finale”. 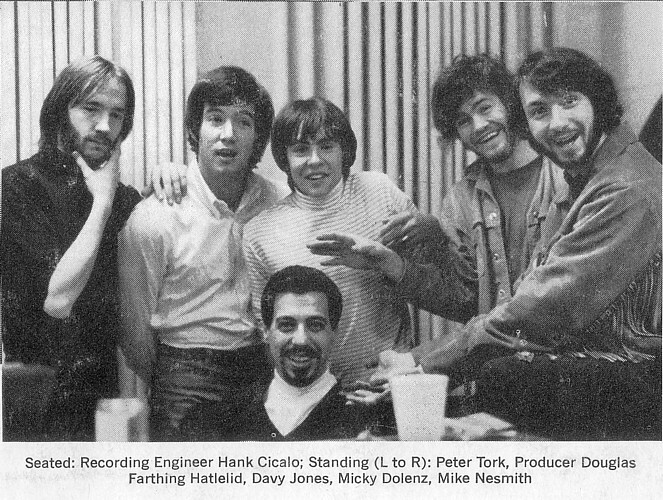 Like Tapioca Tundra, this lyric’s picked up new connotations, and was done with verve as Nez once again sounded particularly “Monkee Mike”-esque, a changed lyric or two aside. As I said on Tumblr, Saturday was easily the best night of my life not involving my husband. I’m a little sad he couldn’t attend, but I hope to assuage some of that sadness tonight, I’m going to clear some space in the bedroom, dock my iPhone, and crank As we Go Along so we can dance like I imagined on Saturday. Finally, on the very, very off chance one of you took leave of your wits and read this, I love you all, and thank you. None of us will ever forget this night. By any rights this tour should go down in the books as one of the best farewell concerts in all of pop history. not totally sure I buy the either/or binary opposition in that lyric, by the way, but that’s my positionality as an optimistic and grateful Nezhead talking. As the show wound down we spotted Jessica Nesmith standing about 6 feet away from us by a side door, recording the finale on her iPhone like the rest of us. :-). After the show the group of us exchanged a few words with her before Cin, Steve, Anissa’s mom Margie and I headed to the car. I understand Mich and our friends Mattie and Enola talked with her a bit longer. Based on those three minutes or so, she appears to have inherited all the best traits of both her parents. A very warm, classy lady who is simultaneously very protective of her dad. Categories: Michael Nesmith, Micky Dolenz, Monkees, Peter Tork, Reviews | Permalink. Thanks for this terrific review. I plan on attending the Philly show (with RosinhaO on 11-29-12. Let me say: I discovered your blog posts by total accident, and have been spending the last hour or so enjoying them while listening to Nez and Peter do commentary tracks on the DVD set. Learning you are also somewhere in Oklahoma is icing on a tasty cake. Thanks. I can certainly relate. It’s interesting how our attitudes towards music change as we get older. They don’t change as much as they expand. I wish I could go, as it’s only 40 minutes away, but right now I can’t afford any tickets. Maybe they’d hold off for a couple weeks until I can? Nah, didn’t think so either!